Hello, folks! We have another fabulous new challenge for you today on the Simon Says Stamp Wednesday Challenge Blog! This week we are ADDING A LITTLE TEXTURE to our projects! Yes, that's right, we want to see you add texture in some way to your creations this week. The design team is showcasing Simon Says Stamp Exclusives on our projects this week. If you have some, we'd LOVE to see how you use them for the challenge, but they aren't required to enter. I pulled out some favorites for this one! I used the Grid Background stamp along with the Dots and Lines stencil to create my physically AND visually textured background. I then added a bit more texture by gold embossing the flower from Friendly Florals and layering that over some gold thread. 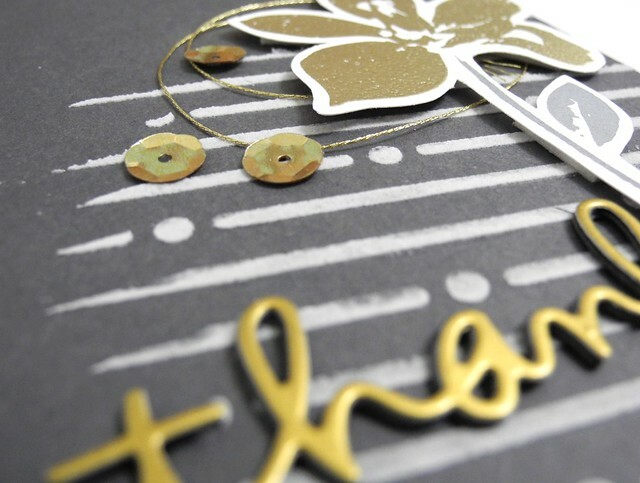 The sentiment is die cut from Bazzill Gold cardstock and layered a few times to give it depth and dimension. I super duper love how this card turned out. As I was beginning the design work on this card, I wasn't sure if I wanted to go with the white grid background or something darker. Soooo...instead of actually MAKING a decision (who wants to do that, anyway), I just went ahead and made BOTH! Here is another take on this design. For this one, the background is left a bit more plain, but the dark color fills that space beautifully. I used the same techniques for the rest of the design and even used the same colors. I love how they are both so pretty, and yet, pretty different. You can find the complete list of products I used for my two cards below, along with links (they are affiliate links) to find the items in the Simon Says Stamp Store. OH! And Speaking of the Simon Says Stamp store, one lucky participant in this week's challenge will win a $50 Gift Voucher to Simon Says Stamp! TOTALLY worth entering, you guys. For reals, though. Just do it. Go make something fabulous! Love 'em both, Jennifer! 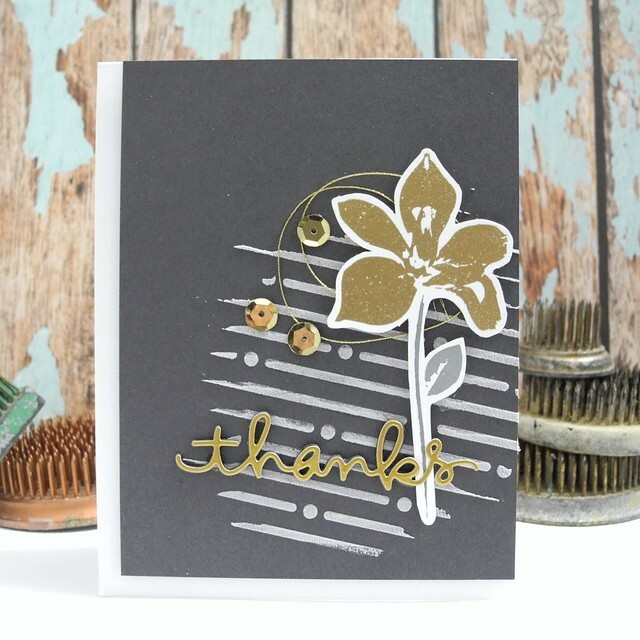 What a wonderful color mix, and I love the way you used the stencil on the 2nd card! Ooooh pretty!! Both of your cards are gorgeous and I love how you mixed up the colors! Jennifer - fabulous cards - a lovely flower and elelments..........both with colour combinations are brilliant although I love the dramatic black based one the most!! Absolutely fantastic card, Jingle!!! What a great color combination! These are GREAT! Love the texture and color combo! Totally awesome and pretty! Love! Wow! What gorgeous cards Jennifer! Love the fab design!! Gorgeous cards - such a different look on them both.